Lee un artículo de robots. Contesta preguntas de comprensión sobre el artículo. Escribe acerca de como piensas que va a ser el futuro. When will we have robots? We already have many kinds of robots! Industries use a variety of robots and now robots are becoming more common in the home. The Husqvarna company makes the Auto Mower, a lawn mowing robot. The robot has sensors which detect where objects are in the yard and it maneuvers around them. The robot can cut the grass while you relax on the patio with a glass of lemonade! Also, Eureka now makes a robotic vacuum cleaner. Like the robot lawn mower, the vacuum cleaner automatically detects where the furniture is and vacuums around it. Cars are becoming robots now that many cars have GPS (Global Positioning Systems) on them. A car with a GPS system can give you directions on how to go somewhere, tell you where the closest gas station is, and, some day in the future, will drive itself. You will take a nap or read while the car drives itself to your destination. We even have robotic pets now. The Sony company makes a robotic dog named Aibo that can sit, stand, and walk like a regular dog but can also communicate and take pictures! Aibo understands certain commands, like a dog does, such as "Sit down", "Stand up", "Turn right", etc. If you ask Aibo a question such as "How old are you? ", its eyes will flash the number of years old it is. Aibo is also a great guard dog. He can patrol the yard and take pictures with a built in camera of anything suspicious. Selecciona "True" (verdad) o "False" (falso) para cada oracion según lo que aprendiste del artículo. 1. We have many kinds of robots now. 2. The Auto Mower is a robot that vacuums. 3. The Auto Mower has sensors that detect where objects are. 4. Cars with GPS systems can give you directions. 5. In the future cars will drive themselves automatically. 6. 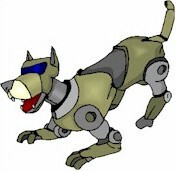 Aibo is a robotic cat. Describe como piensas que va a ser el futuro. ¿Qué aparatos tendremos? ¿Cómo van a ser los carros, las casas, las escuelas, el trabajo, etc.? Escribe la "Lección Escrita" en la sección para comentarios abajo. Inglés Mundial es una comunidad de personas que quieren aprender inglés gratis. Ayúdense unos a otros y si ven un error en la escritura de otro, respondan con la corrección. Para aprender de errores comunes, sigue la página de Inglés Mundial en Facebook, Google+, o Twitter.